Symphony Bridal ....the perfect match for your wedding day! Where can I purchase your wedding dresses and veils? 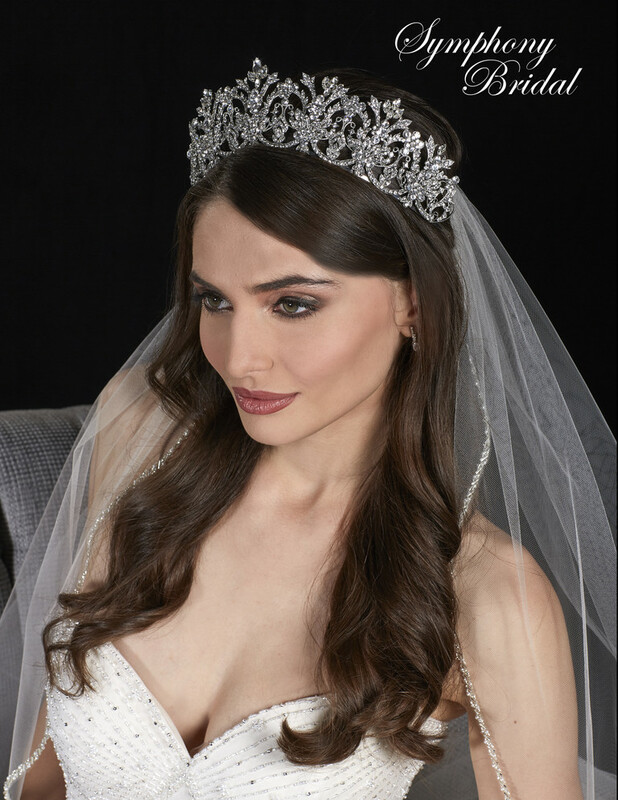 Our Collections of wedding dresses and bridal veils and crowns are available throughout the United States and globally in highly qualified bridal and specialty stores. Use our store locator to find a locally owned shop that carries our collections! If you need further assistance, please call us at 800-992-8345 or send us an email at customerservice@symphonybridal.com. Wholesale accounts are welcome! Contact our customer service department or email us partnerservice@symphonybridal.com, but please include your telephone number and store name and location in any communication. What about the quality, construction and design of your gowns for the bride? Our Collections of wedding gowns, Symphony and Rhapsody, are each designed by us through a collaboration of a team of skilled artisans committed to their work! We use only excellent quality fabrics and embellishments in the fabrication of our timely collections. Our fabrics include smooth rich satins, translucent sheer organza, soft chiffon, beautiful silky taffetas and delicate net overlays, worked with some of the most beautifully beaded embroideries and lace appliqués available. Some are in a limited selection of colored accents. To this we add the latest in modern styling to create a gorgeous gown made to order for your special day. Along with our millinery, our beautiful dresses create- 'the perfect match' for your wedding! What materials are your wedding crowns and veils made from? Our bridal headwear is made with the highest quality crystals, rhinestones, beads and pearls and is available with many color accents. Please ask your local store or contact us at customer service. Our bridal headwear is fashioned into metal crowns and bands which are available in silver, gold, light gold and antique/rhodium/pewter. Flowers are fashioned and formed into delicate styles for the most beautiful effect. We use the best quality veiling in our production. Our wedding veils are embellished with various patterned embroideries and trims, hand sewn and crafted with our premium beads and crystals. We always craft our designs to reflect subtle changes in today's bridal fashion scene, but if you can't find exactly what you want, please let us know! Do you carry destination or informal bridal gowns? You can find some simple and sublime informal and destination styles within the Rhapsody or Symphony Collections! Where else have your wedding gowns and headwear appeared? Besides our beautiful web site which is hopefully our best representative, we have ads featured in national bridal magazines- Bride’s, Bridal Guide, etc. Of course over the many years we have been in business, we have been well represented in bridal shops throughout the country, and that’s still the best place to experience them! Do you have any fashion or trunk shows? We send our lines out to stores around the country throughout the year, which are listed in the Trunk Show section of our website. If you are a store owner and are interested in a Trunk Show in your area, please let us know through email at partnerservice@symphonybridal.com or call 800-992-8345. At the present we exhibit at the National Bridal Market in Chicago and in New York on a seasonal basis which is to the trade only! 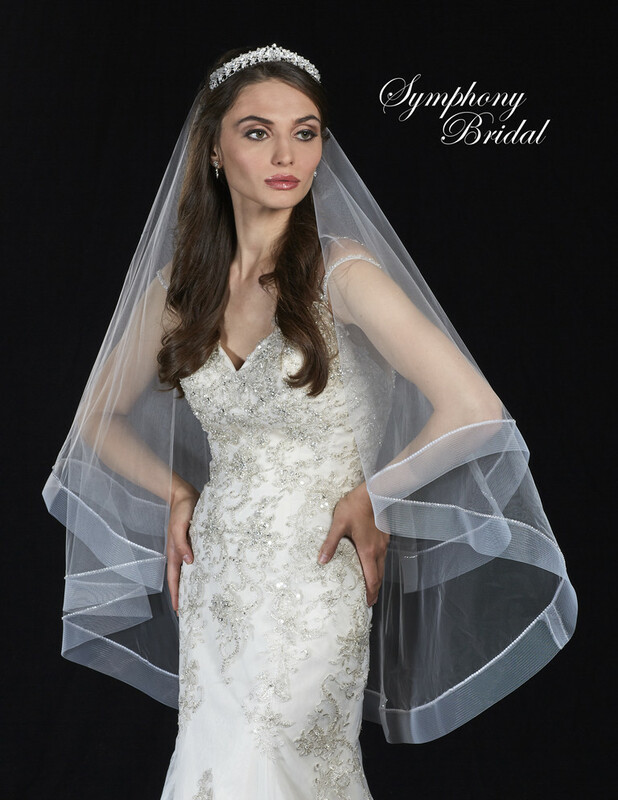 Contact us by email customerservice@symphonybridal.com with any more specific questions, or even better see a store in your area that carries our Gowns, Crowns and Veils! Especially for the brides, we wish you good luck! Can't Find An Answer? Submit your question to us.